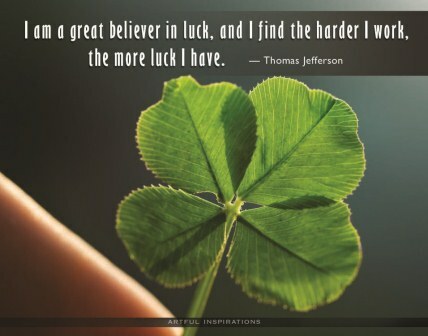 No Such Thing as Good Luck | Choose Your Energy: Change Your Life! Merriam-Webster defines “luck” as “the things that happen to a person because of chance: the accidental way things happen without being planned.” This definition is one of the reasons I avoid using the term. I don’t believe in good luck available to the few. I believe endless good fortune freely accessible to all. Our Divine Source is excellent, limitless and reliable. No external force can block our highest good. Universal abundance flows to and through all of us 24-7. As singer-songwriter Kathy Mattea observes, so often we choose to “stand knee-deep in a river, dying of thirst.” And, the moment we stop choosing to embrace the victim mindset, we find everything we need to survive, thrive, transform and transcend is completely available to us—it was right there all the time. The popular myth that to succeed, you must be lucky, undermines our incredible personal power and the role we play in shaping our own destiny. It implies that some are lucky and some aren’t. This myth, like so many others that sabotage and undermine us, is based in fear-fueled lies. The truth is, good fortune isn’t found in a four-leaf clover or at the end of a rainbow. Nor does it only flow to those born with the right genes or a trust fund. Good fortune is available to all of us. While it may seem that the people who get “all the breaks” do so effortlessly, when you look deeper, you will find they live with attention and intention. They remain open to opportunities by demonstrating curiosity, creativity, planning and persistence. They do not engage in forced marches by trying to give from an empty well. They renew and empower their bodies, minds, hearts and souls with rest, reflection and play. They take baby steps, celebrating every inch of progress with a grateful heart. They live in harmony, promoting sensory balance through mindfulness, wisdom and love. And, whatever their circumstances—most especially when things don’t go as they planned—they remain grateful and empowered by remembering who they are and Whose they are. They are unique cocreative expressions of the Divine. How could that ever not be enough? So how can you realize the essential shift from believing these principles in your head to living them from your heart? Any of us can drift off center occasionally when overwhelmed by stress and gripped by ancient self-destructive scripts. Here are 14 of my favorite tools for recognizing it quickly and getting back on track easily. If you resonate to these 14 tools, click here to download my complete eight-part Daily Spiritual Practice Program for FREE ($97 VALUE). It will teach you to shift your life from an endless, exhausting marathon to a journey of generous, effortless, gracious flow filled with faith, hope, prosperity, peace and joy. The principles will help you stay centered and focused today and every day. You’ll learn to decrease effort and increase productivity and joy so you can kiss stress goodbye and make this year your year to shine! While it normally sells for $97, for a limited time, you have the opportunity to download the entire program for FREE! Join the other “lucky” people who have learned the secret—that choosing your energy changes every aspect of your life personally and professionally. Perceptions, opportunities, relationships and priorities. Ready to start seeing the goldmine rather than the mine field? The untapped potential buried within any perceived obstacles in your life? What change in mindset and behavior will you adopt today to inspire and empower yourself and everyone your encounter? Time to reclaim your personal power to turn unexplored possibilities into fulfilling realities and step into your greatness! This entry was posted in All My Blog Posts, Force, Flow & Baby Steps, Gratitude, Prosperity & Abundance, Mindfulness, Meditation & Peace and tagged Deborah Jane Wells, What are baby steps, What is abundance, What is gratitude, What is mindfulness, What is peace, What is prosperity. Bookmark the permalink.